Andre Dickneite averaged 16 pounds per day en route to winning the Lake of the Ozarks Central FLW Series. Andre Dickneite had no expectations about winning last week's Lake of the Ozarks Central FLW Series. He didn't anticipate coming anywhere close to qualifying for the final day. "I was at one of the lowest points of my fishing career and I'd been debating whether I should even continue," said the 49-year-old from Freeburg, Mo. who runs the hotel division for a window manufacturing firm. "I wasn't having success and I couldn't seem to figure things out. "For this tournament, I only packed enough clothes for 2 days. I figured I'd just go and enjoy myself, doing what I like, even though I wasn't on the fish." He lives just a little over an hour from the lake and has fished it extensively for the past three decades. 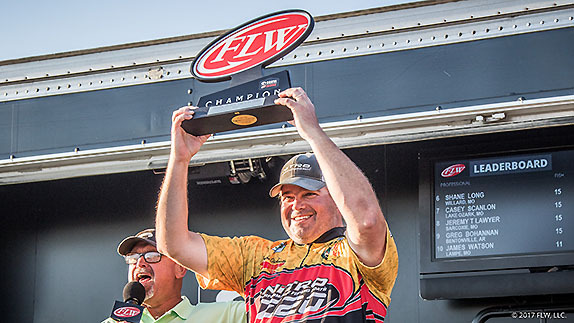 He's had a lot of success, including Central Pro Am and BFL victories, but not much recently. He hadn't even been getting out on the water very often. "I've been married to my wife for 23 years and she told me this year was the least amount of fishing I've done in the entire time we've been married," he said. He caught a break from Mother Nature last week, as weather conditions were sunny and breezy throughout the event. "The weather was perfect for what I wanted to do, which was flip a jig. Two days prior it was cold and overcast and a lot of guys got sucked in by the topwater bite. "I needed the sun to put the fish around the docks and the wind always helps in getting them to bite." His 48-04 total for 3 days left him 2 1/2 pounds clear of runner-up Roger Fitzpatrick. He rose up from 4th place on the final day to claim the $40,000 top prize, which was the biggest payday of his career. A single dock that Dickneite had never fished previously was critical to his success. He found it on the third of his four practice days leading into the derby. "I'd been practicing for 8 or 9 hours a day and catching three or four keepers, and that wasn't good because the lake is full of bass," he said. "I found that dock on Monday and caught a 6-pounder off it, and then I moved over to the next one and caught a 4 1/2. "I got a few more bites after that and I knew I'd finally found my area. It was just loaded with shad." When competition got under way, he focused on two pockets off the upper portion of the main lake, fishing shallow flats that were adjacent to deep water. The dock where he'd caught the 6-pounder surrendered two key fish on each tournament day and he lost one that he estimated at 4 1/2 pounds. "When (current is generated), the water pushes the bait in and the bass come up and ambush them around those docks. The crappie guys had put brush around some of them that I caught keepers off of. "This particular area nobody else had really found and I basically had it to myself all 3 days. I was amazed by that." He boxed 16-13 on day 1 and 16-07 on day 2 to make the top-10. He caught his lightest bag of the tournament (15-00) on day 3 and had no inkling that it would be enough to push him to the top of the final standings. "I thought with 15 that I wouldn't slip from 4th and I might move up to 2nd or 3rd. Not until there were maybe only to bags left (to be weighed) did I think I had a chance. Going from rock-bottom to the king of the hill, I can't tell you how happy I am. It's just a fantastic feeling." His strategy of staying in the upper part of the lake paid off. "If it's a single-day tournament, most of the time you won't win up there � the mid-lake or down by the dam has got bigger fish. For a (multi-day event) I like to run up to where I have enough areas to fish that I can figure out a pattern that'll catch 15 to 16 pounds a day. "Sometimes guys can't get the largemouth to bite and they end up having to fish for Kentuckys (spotted bass) just to fill a limit, and if you've got one Kentucky in your bag you're probably not going to win. From the time I started until it was time to put the rods away, I kept flipping that jig. I wasn't going to get distracted fishing for Kentuckys. I had the experience to know that I just had to keep going. If I didn't get a bite for 2 hours, I had to just stay with it and move on to the next stop." > Flipping gear: 7' heavy-action Falcon rod, Shimano Chronarch E casting reel (7.1:1 ratio), 20-pound Berkley Trilene 100% fluorocarbon or 20-pound Berkley Trilene Big Game monofilament line, 1/2-ounce V&M jig (black/blue), Strike King Rage Craw trailer (black/blue). > He said he often flips with monofilament due to its stretch capabilities on a hard hookset, but prefers the strength of fluorocarbon when fishing around dock cables. > He caught three fish on the final day on a Texas-rigged Zoom Magnum Trick Worm (red bug) with a 4/0 Owner hook, 1/4-ounce tungsten weight (green-pumpkin) and a bobber stopper. "I just thought I should throw them something a little different," he said. "I got a keeper on the first cast with a worm and I came around the side of the dock and caught another one flipping it between the floats." > Main factor in his success � "No doubt, the knowledge I had of the lake was the No. 1 benefit, and No. 2 was just fishing the day." > Performance edge � "I'd say it was my (Minn Kota Fortrex 112) trolling motor. A lot of times I was raising it because I didn't want it making noise on the bottom and I was always conscious of speed � I wanted to be as quiet as I could around the docks so I wouldn't spook the fish."